Sweet dreams, Darla, originally uploaded by Shadrach Meshach & Abednego. 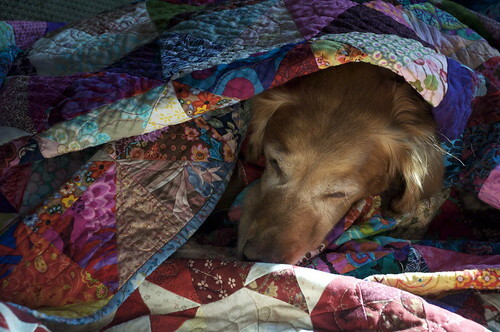 Had to post this photo of my quilts in use. Doesn't it make you want to take an afternoon nap in the sunshine? Wishing everyone a very happy 2010, with good health (above all), good times with family, prosperity, and lots of time to quilt! 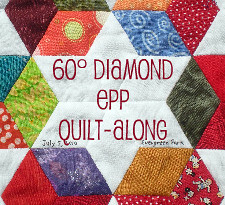 I'm so happy I met all of you wonderful bloggy folk who keep my quilting mojo high! Here we are approaching the beginning of a new decade! I remember so clearly standing in front of City Hall with my husband and six year old daughter on the last night of 1999, counting down and watching the fireworks. Remember the Y2K scare? May all our worries turn out to be so groundless! I have thoroughly enjoyed getting back into quilting this year - in case you don't know, I resumed quilting in August after a hiatus of almost 15 years. Here's a whirlwind tour of what I've finished in 2010. "I'll Be Seeing You" - my late mother made the top and I quilted it on the anniversary of her passing. "Valley of the Dolls" - for my mother-in-law. "Blue Meanies" - originally meant for my daughter. 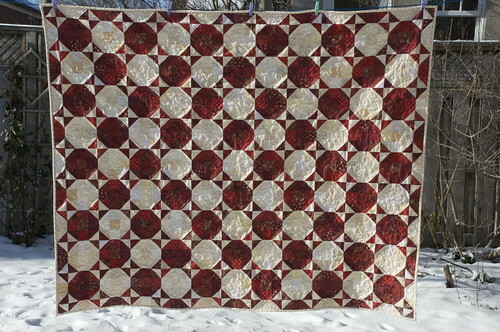 "My Mother's Christmas Quilt" - she pieced the top and I quilted it for her husband. "Wine Gums" - my daughter wheedled for this one instead. 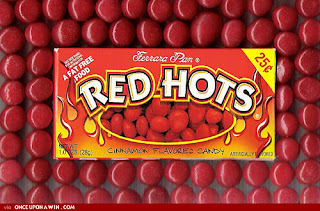 "Red Hots" - just sneaked under the 2009 wired with this one. #1: Applique - I've never done this but it's time to learn! 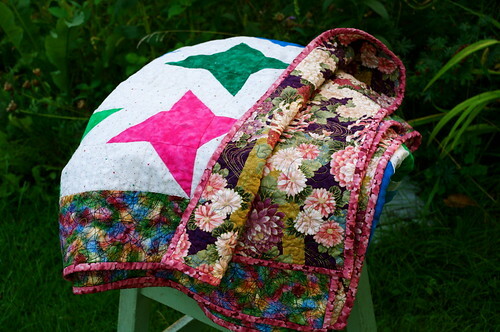 No photo for this one, but I would like to get involved in quilting for charity in some way. If anyone has any good ideas on this score - particularly Canadian ideas - I'd love to hear about them. 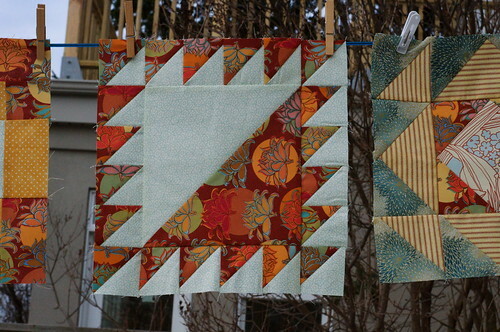 What are your New Year's Quilting Resolutions? 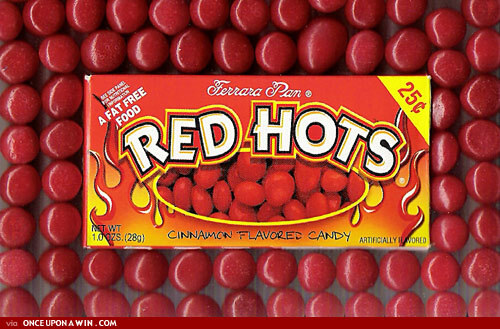 Red Hots, originally uploaded by Shadrach Meshach & Abednego. At last! The Red and White Snowball Challenge is complete! This was a very fiddly quilt, but I'm very happy with the end result. The dimensions are 58" x 72", made with 6" (finished) blocks. As you see, I opted for the non-point option, and I think that was the right decision. I spent some time thinking about borders for the quilt, but in the end opted to go naked, as the book shows. I had already bought the backing, and was nervous about not having enough to accommodate borders. 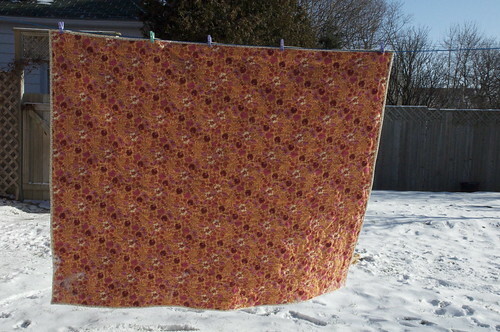 The binding is a pale yellow with small red flowers that I'm using as background for another quilt. The back is Anna Maria Horner flannel. I am a flannel addict now, after the Wine Gums quilt and now this one. 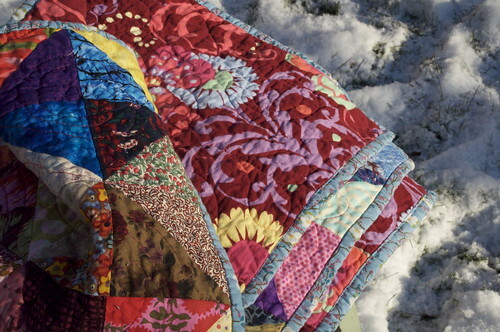 It's soooo soft and lovely, just perfect for a winter quilt. And for this first time, I used a wool batting. The directions say machine wash and lay flat to dry. I haven't tried that yet, since I am waiting for a friend to deliver a box of Colour Catchers before I dare the wash with this red and white fabric. But the wool was lovely to work with - it makes for a higher loft than the bamboo/cotton that I've been working with, and there's not the same drape, as a result. I machine-sewed the binding (don't shoot me), but there were some places where it didn't catch properly on the back. So as I sat with the quilt on my lap, whipping down those little spots, it seemed to me that it was noticeably warmer than the Wine Gums quilt, which had a similar flannel back but was batted with bamboo. I'll keep updating with how I find the wool batting over time, since it seems that wool is less commonly used than cotton or bamboo these days. 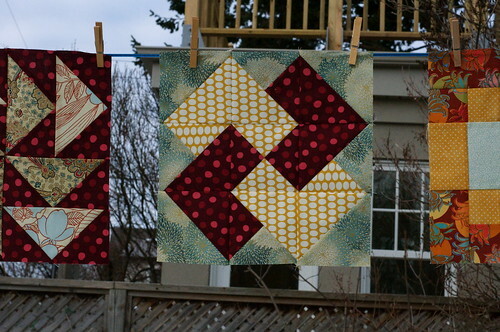 I can't say that I'm mad for the loop-the-loop quilting that I did, but I think it's okay. 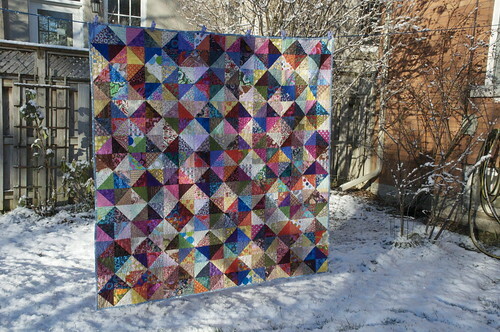 I'm thinking about tying the quilt in the centre of those quarter-square triangles made when the blocks meet, but I'm not sure. It may be a case of less is more. 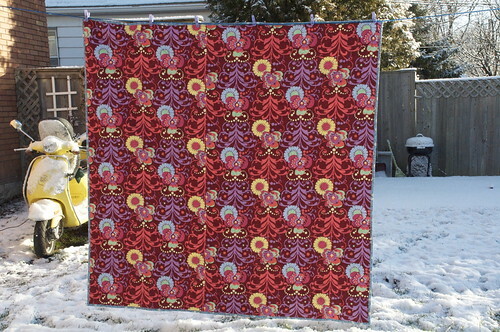 I had to name this quilt Red Hots. Do you remember these candies? I'm not sure you can still get them, although you can definitely get cinnamon hearts around Valentine's Day. 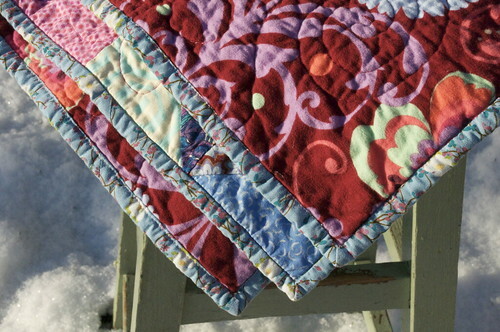 I thought it was a perfect name for this warm and toasty quilt! sampler blocks, originally uploaded by Shadrach Meshach & Abednego. 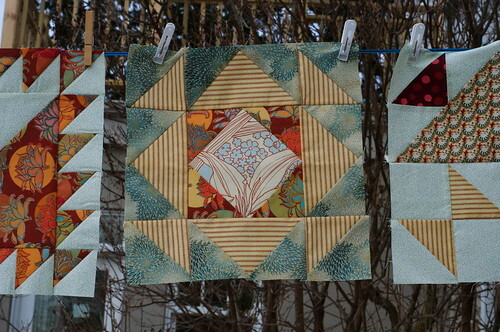 I am done with the blocks for the Modify Tradition quiltalong. Here are the 12" blocks that I've made. 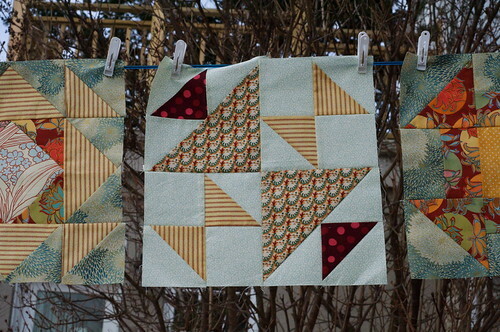 Two blocks, bow tie and nine-patch, I made in 6" versions, because I like the idea of having blocks of different sizes. 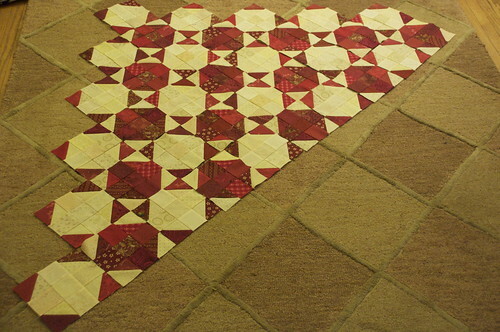 I also plan to add a few plain setting blocks in the 6" size to give the eye a place to rest in this busy quilt. I did not make Courthouse Steps, because, while I like that block, I don't like it alone, as it would be in a sampler. I am considering making four of them in the 6" size, but so far have resisted the overpowering urge to sit down and figure out the math (joke, right?). A few posts ago, I showed some of the blocks I had made to that point. Here are some of the later ones. To tell the truth, I'm not 100% in love with this quilt so far. I am battling a traditional dislike of samplers, and I'm not loving the colours so much anymore. 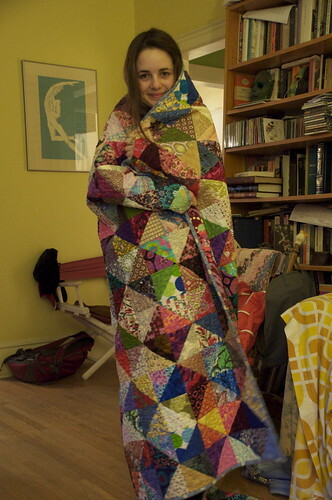 However, I know that I go through this honeymoon-is-over phase with all my quilts, so I'm reserving judgment. I think I'm going to use a very thin sashing between the blocks. Initially my inclination was t have no sashing at all, but I think it will be too busy without some kind of separation. But just the thinnest of sashing, maybe three-quarters of an inch. I have two candidates in mind for the sashing: a deep red and a dark turquoise. They both look good, but very different. It was really cold this morning, and my fingers were like chunks of ice, pinning these blocks up on the line to take a photo. 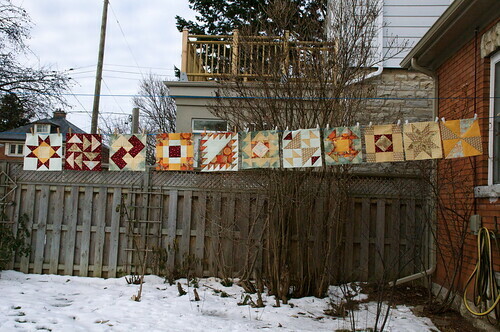 I kept thinking how warm the quilt would be once they were all sewn together. I may love it then. P.S. It's Friday - everyone's been sewing and now they're telling. 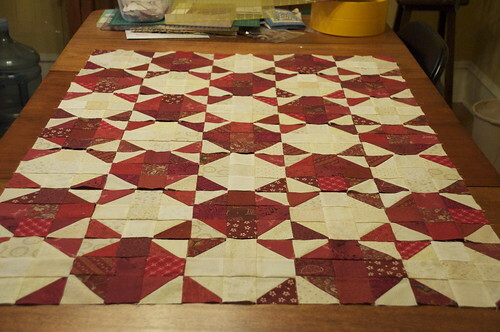 I'm counting this as a finish since I have completed all the blocks, so I'm logging this post on Amy's page. Go check out the awesomeness here! 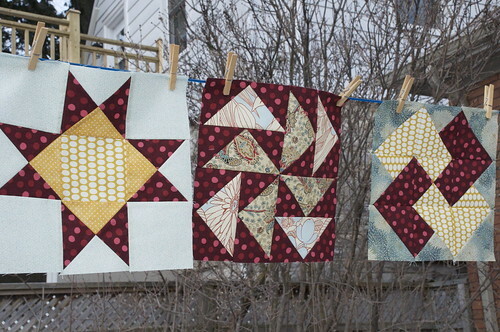 Warning: There are no quilts in this post. 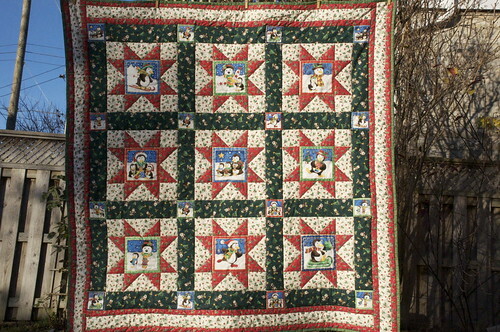 Seems like the quilting blogopolis in awash in the red and green of Christmas. 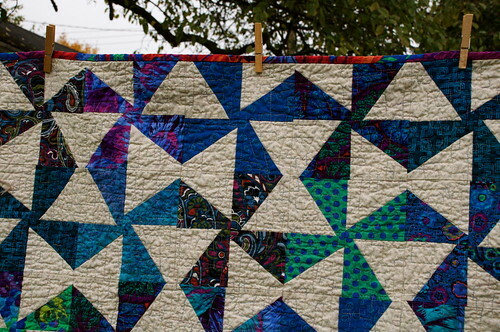 Jewish quilters are a rare breed, it seems! 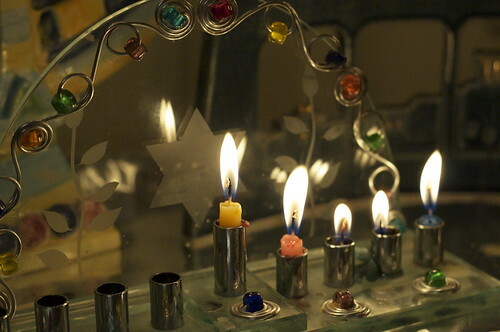 But there are a few of us around, and here are a couple of pics to show what we've been up to - last night marked the beginning of the fourth day of Chanukah. 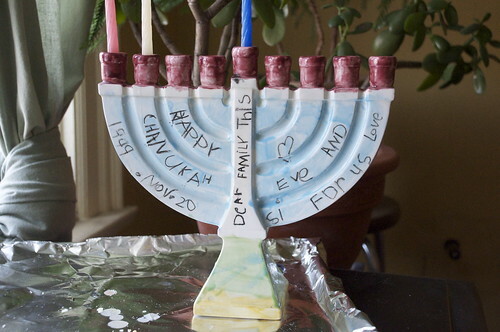 Here's the back of a chanukiyah my daughter made when she was five. It says "Dear Family, this is for us. 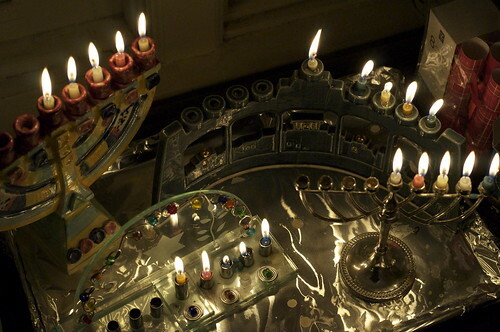 Happy Chanukah and Love, Eve.". I love that all the words are there, but squished in wherever she could find space, never mind about the word order. 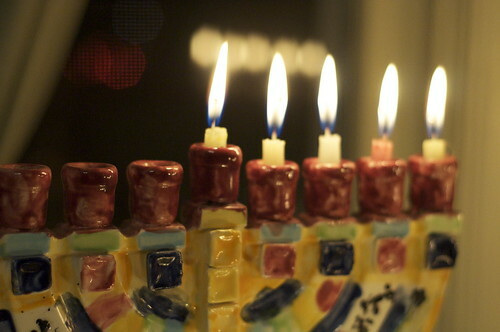 Chanukah is not a religious holiday. It celebrates a military victory of the Maccabees over the Syrians and the reclamation of the Temple. 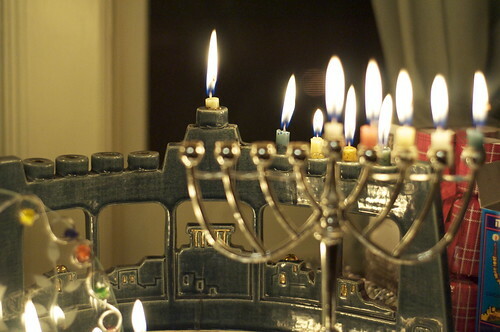 The miracle of Chanukah refers to the story that when the Temple had been rededicated, and Judah Maccabee went to light the eternal flame, there was only enough oil to burn for one night. By a miracle, the flame burned for the entire eight days that were required to obtain a new supply of oil. The letters on the sides of the dreidel represent the words Nes gadol haya sham, or A great miracle happened there. 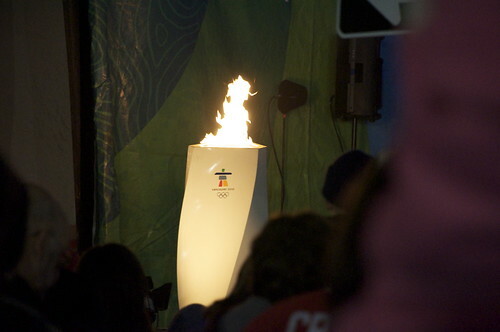 As you know, the Winter Olympics are in Vancouver this winter, and the torch is making its way across the country. Last night, the torch came to our town, carried by Vicki Keith, best known for her swim across Lake Ontario. Seems like the whole world turned out! There was such a crush I wasn't able to get my camera out in time to capture Vicki lighting the flame from torch, but here's a nice photo from a better photographer than me. 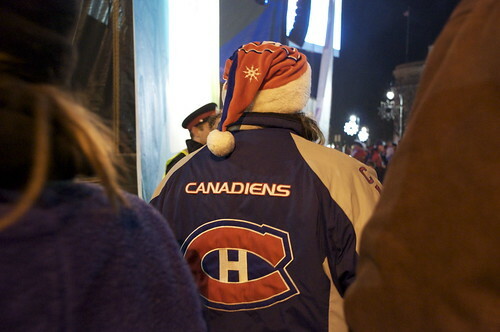 Lots of proud Canadians in market square last night. I love this guy. 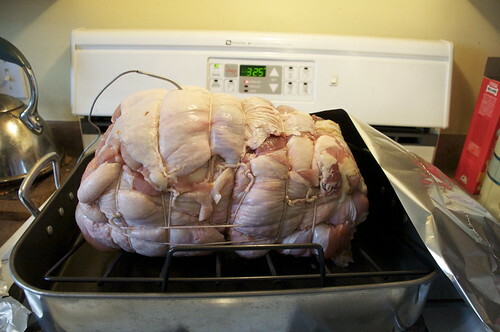 Oh, and I couldn't end this blog post without telling you about my experience cooking a turducken! 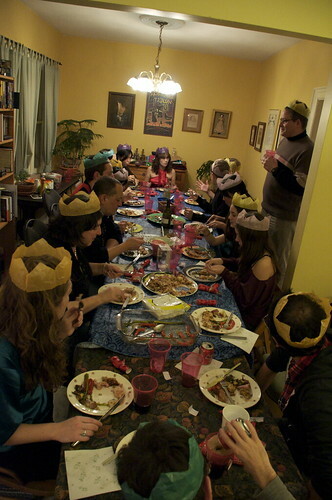 On Saturday night I hosted my students and their significant others in our tiny, tiny house for our lab holiday party. It was presented to me that it would be an excellent idea to roast a turducken, which is a boned chicken stuffed inside a boned duck, stuffed inside a boned turkey, all stuffed with dressing. 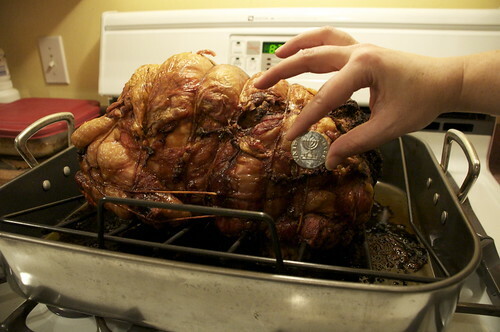 It weighed 25 pounds when Winnie, one of my students, dropped it off on Friday, with the instructions written out by the butcher: "Cook for 4 hours at 325. Internal temperature must be 180." We were all assembled at 6pm, but the dang bird(s) wasn't ready until after 8pm. 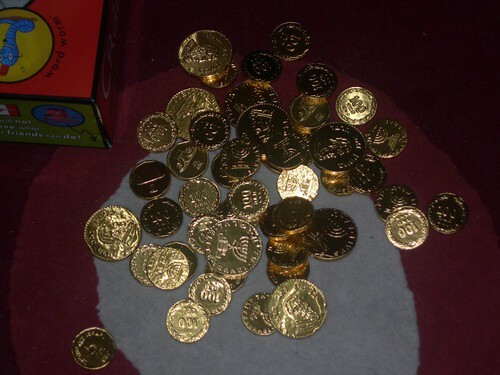 Never mind, although we were hungry, we whiled away the time playing poker dreidel and eating the chocolate money that we won. I lost all my money before I could eat it, so that was good for my waistline. 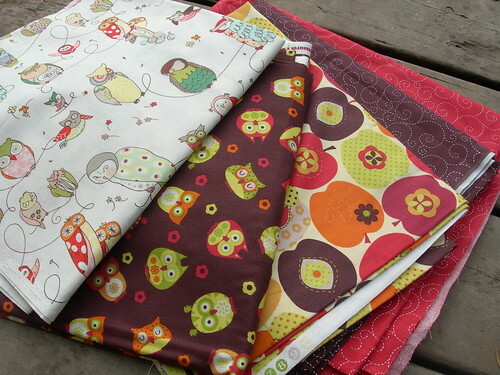 The Incredible Shrinking Quilters will be proud of me! Happy holidays -- no matter what kind -- to all of you! The Values quilt is finished, and I love it! 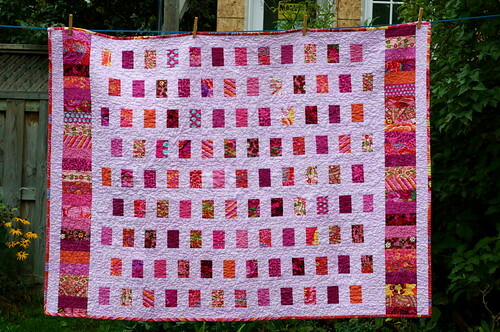 Can words express how in love with this quilt I am? 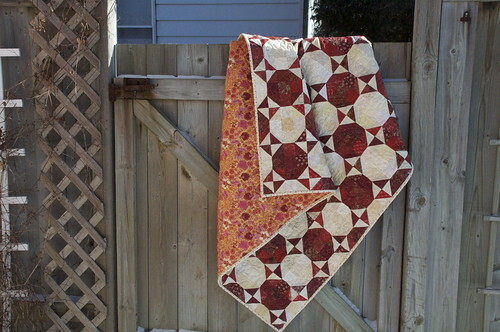 The name of this quilt is Wine Gums, since that's what those darker diamonds remind me of. Let me just show you some photos. The Amy Butler flannel (Paradise Garden in wine, from the Love line) was glorious to work with. 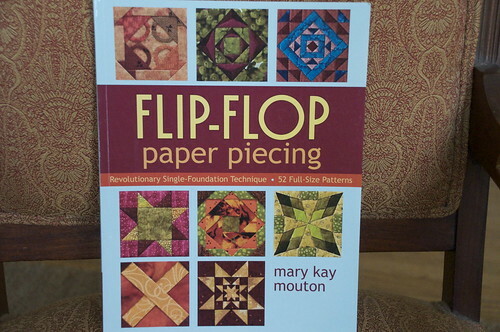 Contrary to my expectations, it didn't fuzz up too much or fray or cause any quilting problems. I sprayed it with Mary Ellen sizing before assembling, but I don't really think that made too much difference. I had planned to use spray starch, but forgot to buy any. 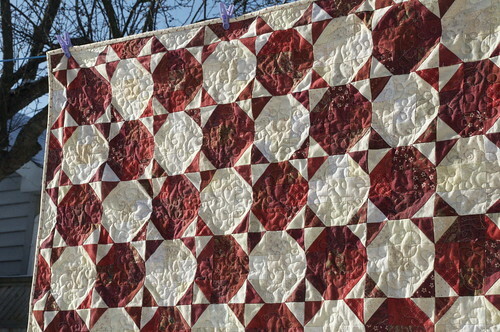 The flannel does add to the weight of the quilt, in a delicious way once it's finished, but it did make the quilting process a bit more challenging on my domestic machine. I quilted it with two colours of King Tut red cotton, in a kind of spiral pattern over each diamond and a weird kind of poorly thought out swaggy thing on the edges. It quilted up fast that way. For the first time ever, I sewed the binding on by machine. It's not perfect, but it's not bad, either. I had a look at Rita's tutorial, and did it more or less like she suggests, but with basting instead of pinning and without all the zigzagging. 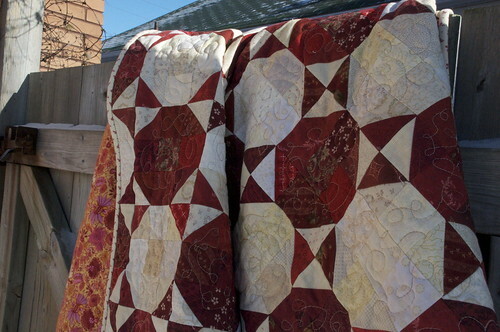 I find the zigzagging to stabilize the edge isn't necessary if you sew the binding to the raw edge of the quilt before you trim the excess batting and backing. I saw this technique in a Fons and Porter show on PBS, and have done it this way ever since. I find I get a fatter bound edge, which has a satisfying feel to me. Anyway, I think the ditch-stitching on the front is about 90% hidden and I caught the back edge properly about 85% of the time (had to finish up those holes by hand). But I'm pleased with it. AND (drumroll, please) all four of the mitred corners are perfect! That is a definite first for me! Many thanks to Katie, who as the leader of this quiltalong, is the godmother of the Wine Gums quilt. And, as I said in a previous post, this quilt is for my daughter, who is usually too blase to be interested in my quilting, but was uncharacteristically enthusiastic about this one. She likes it, and I do, too. Now, over to Amy's to see the other Sew-n-Tell goodness! And Maynard's is the archetypal brand, at least in Canada. Resistance is futile, originally uploaded by Shadrach Meshach & Abednego. Winter is here. 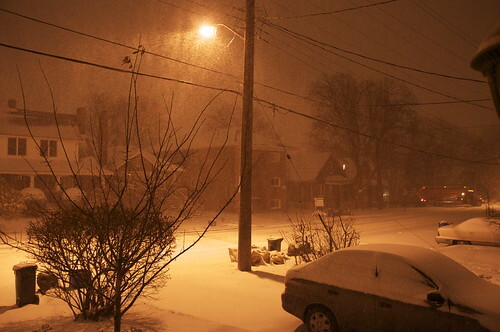 The first snow storm of the season. 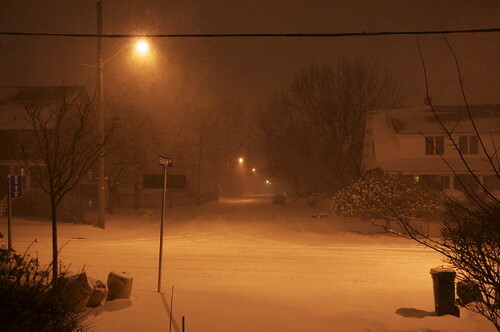 20 cm or more expected in the Ottawa Valley, probably a little less here because of the "lake effect". I took my Vespa in for winter storage yesterday. Just in time! Times like this I wonder why I ever left the South. I could be scooter riding all year round. No shoveling. No getting plowed in after shoveling. No winter boots and no carrying your shoes in a plastic bag. No picking snowballs from between the dogs' toes. Sigh. The photo above shows the blocks set out as they are in the book. The photo just above here shows the blocks set out on point. What do you think. Honestly, I thought I would like them set better on point, but now I'm not sure. The snowballs look more like boxes and less like snowballs. The jury's still out, though. What do you think? Leave me a comment to say which one you prefer and why. The weather's nasty now, but on the weekend it was quite sunny, although fairly cool. 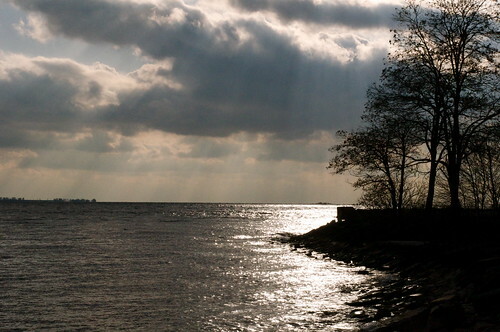 Mr. Pickledish and I took Darla for a short walk down by Lake Ontario. 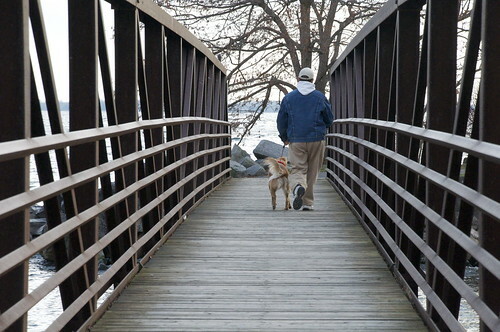 It was quite windy by the water, but there were plenty of ducks and seagulls, and people walking dogs (that's Mr. PD and Darla). I snapped this lovely, public proposal. I hope she said Yes. Don't you? Sunday stash, originally uploaded by Shadrach Meshach & Abednego. Don't know why I'm so into owls lately. Maybe it's because I'm in my fiftieth year, and they say wisdom accompanies age. If that's so, I'm clearly seeking a little external help! And some of these owls look a bit more crazy than wise! I don't have any plans for these at the moment, but I couldn't resist snapping them up as soon as I saw them. Hmmm.... impulsiveness is not very wise, is it? 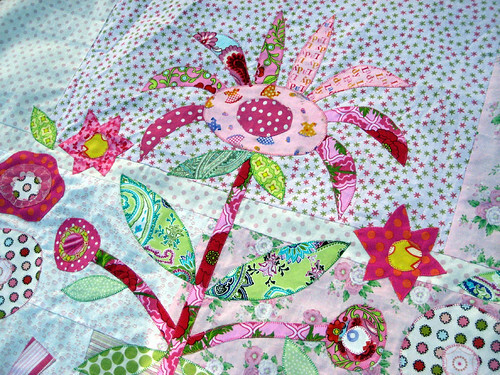 Lola's Quilt, originally uploaded by Julie Antinucci. Looky! 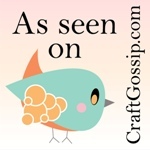 This is just the inspiration I need to make me take up applique! 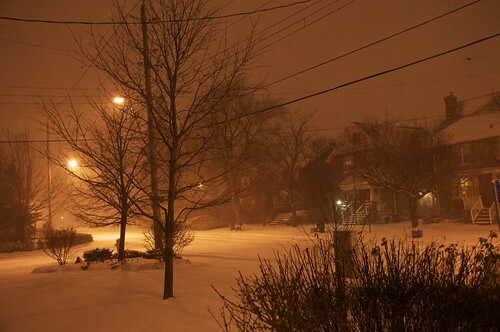 This is from Julie Antinucci's Flickr photostream (click through to see more of her photos). 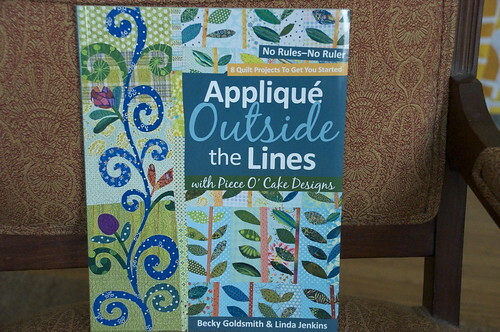 She credits the Goldsmith and Jenkins book "Applique Outside the Lines". Awesome! I have long been tempted to become a better applique-er (sp?) 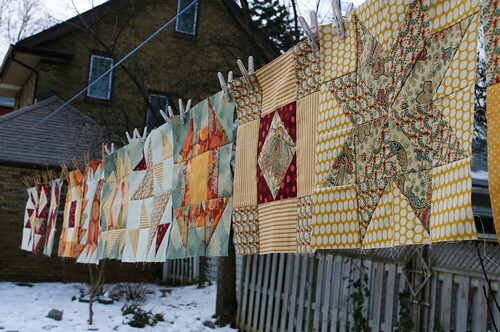 - and it's definitely on my New Year's Quilting Resolutions List now. 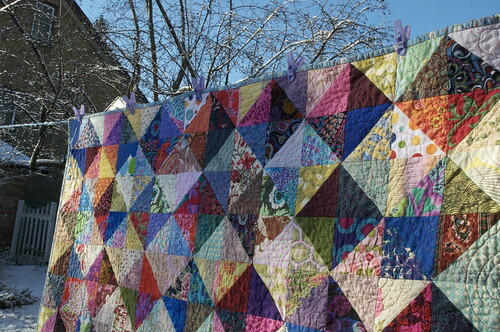 Do you have any New Year's Quilting Resolutions?